FCC Chapter Meeting In various Cities Nov.7 09The Topic 101 things made out of Bamboo. October 1 through 4, 2009 - The 2009 American Bamboo Society Annual Conference will be held at the Hotel Murano in Tacoma, Washington. Here's the official announcement. As soon as more details are available, the information here will be updated. Central Florida Valkaria Gardens tour/meeting - This June 24th event was a big success as more than 70 people showed up for the tour and lunch at John Rogers' home/garden. 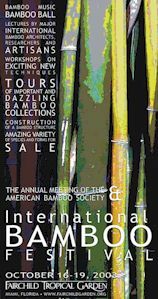 ABS Annual National Meeting: Bamboo 2000 - The meeting was held October 12 - 15, 2000 at Zoo Atlanta. There were 101 members from all over the world in attendance. 2/26/2000 - Ahmed speaks on propagation. 4/15/2000 - Richard presents S.E. Asia trip. 6/11/2000 - Annual Bamboo Festival. Click the links to view pictures of year 2000 events.